Ann Arbor planning commission meeting (March 5, 2013): Despite protests by members of the Library Green Conservancy and hesitation by some commissioners, the city planning commission voted unanimously to add the Connecting William Street plan to its list of resource documents that support the city’s master plan. After the vote, Wendy Woods tried to reopen the item for reconsideration, but she was unsuccessful in garnering support from the majority of commissioners, so the initial decision stands. 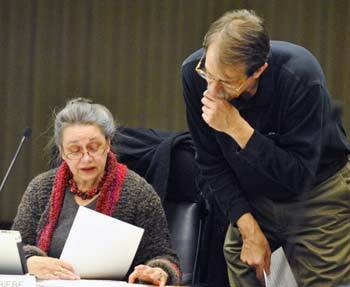 Jack Eaton talks with Sabra Briere before the start of the Ann Arbor planning commission’s March 5, 2013 meeting. Briere serves on the commission as the representative from city council. Eaton spoke during a public hearing on the Connecting William Street plan. 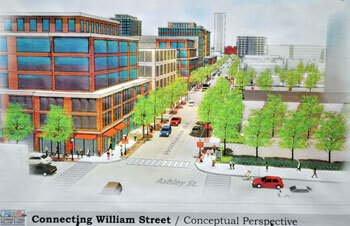 The Connecting William Street project was undertaken by the Ann Arbor Downtown Development Authority at the behest of the city council. It focuses on recommendations for coordinated development of five city-own sites in the William Street area, on the south side of downtown. By becoming a resource document, the CWS plan carries less weight than it would if it were part of the city’s master plan. Amber Miller of the DDA gave a presentation during the March 5 commission meeting, similar to those previously given to the council and the DDA board. Much of the discussion among commissioners focused on the issue of open space. Miller noted that recommendations on that issue have been deferred to a committee of the city’s park advisory commission. That downtown parks committee is in the early stages of its work – it was scheduled to meet earlier in the day on March 5, but that meeting was canceled. Commentary during a public hearing on the CWS plan also focused on open space, with several members of the Library Green Conservancy advocating for a centrally located park atop the Library Lane underground parking structure. They criticized the DDA’s process for developing the plan, and felt the planning commission had not adequately publicized the fact that a public hearing on Connecting William Street would be held that evening. Additional public commentary came after the commission’s vote. 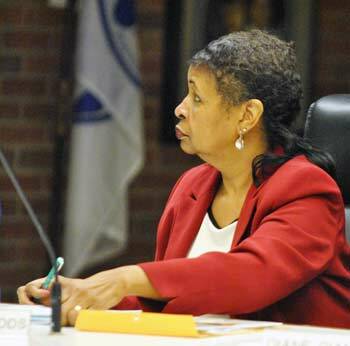 Woods said her decision to ask for reconsideration of the item was prompted by concerns raised during this final public commentary. She felt it wouldn’t hurt to wait two weeks until the commission’s next meeting, so that more people could have the chance to weigh in, if they wanted. Sabra Briere, who had expressed strong reservations before casting her original yes vote, said she supported Woods in her effort to reconsider the item, suggesting that postponement would be appropriate. She expressed concern that the commission was deciding to use the CWS plan as a future planning document – which would be referenced when the planning staff and commission make their recommendations to the city council on site plans and other planning and development actions. Given that importance, Briere – who also serves on city council – wanted to be absolutely certain before accepting it. Other commissioners disagreed. Kirk Westphal, the planning commission’s chair, also served on a DDA leadership outreach committee (LOC) that helped craft the Connecting William Street plan. He said he felt extremely comfortable with the public process that had led to these recommendations. Eric Mahler also argued against reopening the item for another vote, saying the commission needed to bring closure to this long process. He was satisfied that sufficient public notice had been provided. It’s unclear whether the city council will take any action on the Connecting William Street plan. As to what happens next, Susan Pollay, the DDA’s executive director, told planning commissioners that the DDA will be following the council’s guidance. Councilmembers have already taken a first step related to one of the five parcels – the former YMCA lot. At their meeting on March 4, 2013, councilmembers voted to direct the city administrator to prepare an RFP (request for proposals) for brokerage services to sell the lot. A $3.5 million balloon payment on the property is due at the end of 2013. Since the summer of 2011, the Ann Arbor Downtown Development Authority has been working on the Connecting William Street project, which was undertaken following a directive from the city council at its April 4, 2011 meeting. Streetscape view looking down William Street toward the east from Ashley Street – a schematic rendering of the Connecting William Street recommendations. The work focuses on future use of five city-owned parcels in the downtown area: (1) the Kline parking lot (on the east side of Ashley, north of William), (2) the parking lot next to Palio restaurant (northeast corner of Main & William), (3) the ground floor of the Fourth & William parking structure, (4) the former YMCA lot (on William between Fourth and Fifth), which is now a surface parking lot, and (5) the top of the Library Lane underground parking garage on South Fifth, north of the downtown library. The DDA board adopted the recommendations at its Jan. 9, 2013 board meeting. The city council was briefed on the recommendations at a Jan. 7, 2013 working session, but has not taken any other action on the plan. 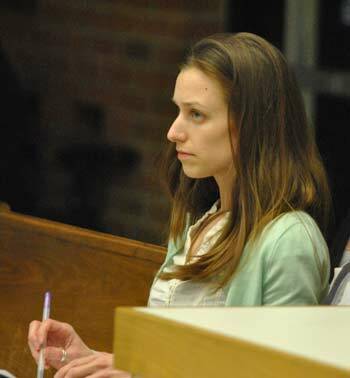 Amber Miller of the DDA gave a presentation during the March 5 planning commission meeting, similar to those given to the council and the DDA board. She described the public input process that the DDA had undertaken, and highlighted recommendations in the CWS report. Broadly, those recommendations are organized into eight categories: (1) adjacencies – improving the pedestrian experience and spaces between buildings; (2) streetscape and transportation; (3) parking; (4) density & massing; (5) land uses; (6) architecture; (7) street “edge” – building design that showcases active ground floor uses; and (8) sustainability. DDA executive director Susan Pollay arrived after Miller’s presentation, but was on hand to answer questions. The city council’s directive in April of 2011 had called for the DDA to engage in a public process with experts, stakeholders and residents, and then to develop a plan for those five parcels. The council’s resolution described a step in the process when the city council and the planning commission would adopt the recommendations on the five parcels into the city’s downtown plan. The downtown plan is one component of the city’s master plan. Other components include: the land use element, the transportation plan, the non-motorized transportation plan, parks and recreation open space (PROS) plan, and the natural features master plan. Based on the phasing described in the council’s April 2011 resolution, any request for proposals (RFP) to be made for the five parcels would come after the planning commission and the city council formally adopt recommendations on the five parcels into the downtown plan. The original agenda item for the planning commission’s March 5, 2013 meeting – posted on the city’s online Legistar system – referenced the downtown plan: “The Planning Commission will consider whether to consider the Connecting William Street Plan as an amendment to the Downtown Plan.” Prior to the meeting, no resolution or staff memo for this item had been posted. 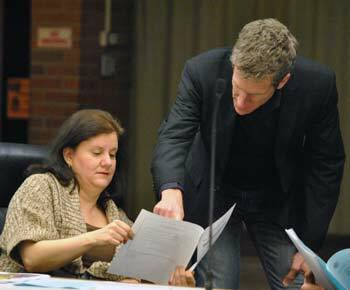 RESOLVED, That the Ann Arbor City Planning Commission hereby approves the “City of Ann Arbor Resource Information In Support Of The City Master Plan Resolution,” dated March 5, 2013. An attachment to the resolution included an updated resource list, with the Connecting William Street plan as one of 13 resources. 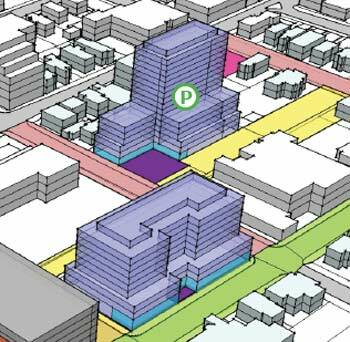 The other 12 resource documents – listed on the city’s website for its master planning documents – include the downtown design guidelines, the Washtenaw Avenue corridor redevelopment strategy, and a flood mitigation plan, among others. During the March 6 meeting, concerns were raised about the timing of adding this CWS resolution to the planning commission’s agenda. It had not been mentioned at the commission’s previous meeting, on Feb. 21. Typically, each meeting includes a notice of public hearings that will take place at the subsequent meeting. And at a meeting of the planning commission’s ordinance revisions committee on Feb. 22, there was even some discussion about the possibility of canceling the March 6 meeting, for lack of any agenda items. That Feb. 22 ORC meeting had been attended by several commissioners, including chair Kirk Westphal. But the March 6 meeting ultimately proceeded as scheduled, with consideration of the CWS plan as the only action item on the agenda when it was posted on Legistar on March 1. 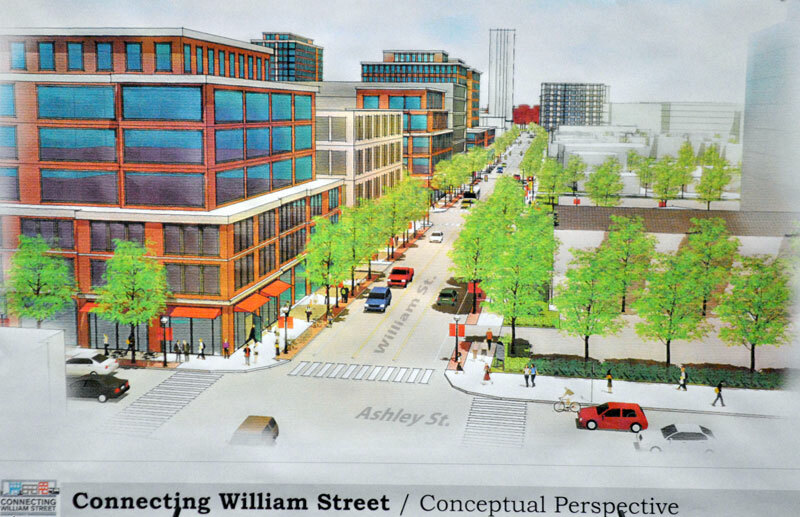 The need for more open space and a centrally located downtown park was highlighted by the five people who spoke during the planning commission’s March 5 public hearing on Connecting William Street. Most of the speakers were affiliated with the Library Green Conservancy, which is advocating for a park on top of the Library Lane parking structure – one of the five sites in the Connecting William Street plan. Ethel Potts told commissioners that the public hearing had not been well-publicized – and she presumed they would hold another one. She found the process to be very frustrating. The survey that had been conducted by the DDA was “amateurish,” she said, and didn’t even try to ask the public what they wanted to talk about. There were lots of group meetings, but “they were sort of a set-up,” Potts said. Participants were given something to respond to, she added, but the meetings weren’t designed to allow people to simply say what they wanted to say. So for her, the public outreach “was quite unsatisfactory.” If the planning commission wants to really know what the public thinks, commissioners might have to supplement the DDA’s process with public hearings and other outreach efforts. She also argued that many of the underlying documents used by the DDA to develop this plan were dated, and shouldn’t be used until they were updated. 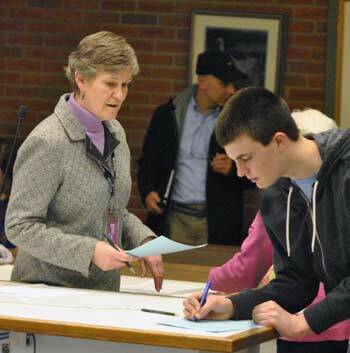 Planning manager Wendy Rampson signed agendas for Skyline High School students as proof that they attended the March 5 planning commission meeting for a class assignment. Eaton also contended that William Street is not the core downtown, but rather the edge of downtown. The CWS recommendations suggest putting up buildings that go right to the sidewalk, he said. That doesn’t make the area more walkable – it makes it less pedestrian friendly. The CWS plan is fundamentally flawed in its process, he concluded, and is too narrow in its recommendations. He urged commissioners not to act until they received recommendations from the city’s park advisory commission and environmental commission. After that, the planning commission should proceed from those broader views. Will Hathaway said he’s a lifelong resident of Ann Arbor, and a member of the Library Green Conservancy. They’ve been following the process closely and trying their best to encourage people to participate, he said, but it had been frustrating and difficult to believe they were being taken seriously. In fact, it seemed like the process was preordained to end up were it did, Hathaway contended. It was unfortunate that there was confusion about that night’s public hearing, Hathaway said, because the commission could have heard from a lot more people who had similar experiences with this process. Alluding to a reference by Amber Miller that the CWS plan reflected what the DDA heard from the public, Hathaway contended that “it’s only what the DDA allowed itself to hear.” A lot of input had been intentionally screened out, he said. The only reason there’s now a focus on open space is because “we wouldn’t go away. We had to really make ourselves a nuisance instead of just participating.” That’s because there wasn’t a good-faith effort to welcome public input and have a real dialogue, he said. If the commission makes the CWS plan a resource document and relies on it for planning purposes, then they will be enshrining a misleading process, Hathaway said. It’s not fair to say the plan is based on legitimate public input, he said, and the underlying documents examined by the DDA were “cherry-picked.” Hathaway also felt there was a missed opportunity with the land use economist hired by the DDA on this project – an expert who helped create the High Line park in New York City [Todd Poole of 4ward Planning]. “But they didn’t even ask him for any input about how a public park in Ann Arbor’s downtown could generate benefits.” The DDA hadn’t been open to new ideas, he concluded, and this hadn’t been an honest public process. Stephan Trendov told commissioners that he’d gotten really involved in the Library Green effort, and had analyzed different options for that property. The Library Green group has come up with different ideas for that site, such as putting buildings there that are 3-4 stories high. The DDA is now saying that there can be a small area for grass. The final speaker was Alan Haber, who said it seemed that commissioners were just looking to respond to the DDA’s work product, rather than actually discuss what should be happening downtown. He hoped that they didn’t take it on as a resource document. It’s flawed in two ways, he said. The DDA took as its mandate to put a building on every property, “but that wasn’t in the mandate.” The mandate was to look in an integrated way at how these properties can be developed to benefit the downtown, he said. That doesn’t necessarily mean a profit-making building on every property. It could be a civic building. Haber remembered the days when Ann Arbor had a center – a courthouse and a green, a sense of having a center. That has been dissolved, he said. In its place is a vision of buildings everywhere. But there’s another vision, Haber said – a place that can be a center, that’s built by the community and is a living, vibrant focal point. And “the only place to make it is on that Library [Lane] lot.” If the commission wants a center, Haber said, then they shouldn’t accept the DDA’s report. That’s what the people want. Planning commissioners had an extensive discussion about the CWS plan, covering public process, open space, density, zoning, and a range of other topics. This report organizes their remarks thematically. Sabra Briere began by apologizing to the public. Several people had emailed her, she said, asking if there would be a public hearing. She had relied on an email she’d received from planning staff the previous week that had described the agenda item as a “discussion,” and that’s what she communicated to others. “I did not realize it was a public hearing until tonight.” She had imagined that if the commission planned to hold a public hearing on this topic, it would be broadly noticed. Briere felt that more people would have attended, if she had responded in a different way. Amber Miller of the Ann Arbor Downtown Development Authority. Tony Derezinski asked for more information about how the commission’s meeting had been publicized. 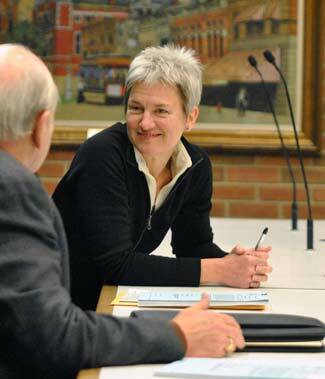 Planning manager Wendy Rampson said the meeting was advertised in the Washtenaw Legal News, and the meeting notice had been emailed on Friday, March 1 to anyone signed up for the city’s GovDelivery system. The agenda posted on Legistar stated that the CWS item included a public hearing, but Rampson said she wasn’t sure how many people looked at the agenda in that level of detail. Derezinski said he had had no doubt that the commission would be considering this matter at the meeting. He noted that the people who spoke during the public hearing are ones who have consistently been very “energetic” in stating their beliefs, and he’s seen them at several meetings. He asked Amber Miller how many public hearings were held on the CWS project, saying he had attended two. Miller replied that after the initial CWS plan was drafted, there were about 30 public meetings and three public webinars. Briere noted that the term “public hearing” has a specific meaning. There have been a lot of public meetings, Briere said, but that’s different than a public hearing. Bonnie Bona asked about the written comments that were made by the public, as part of the CWS survey. Would those be included in the report? Miller replied that the comments from the survey are on the DDA website for the CWS project. Kirk Westphal, who served on the CWS leadership outreach committee, praised the DDA, saying he didn’t think there’s been a planning process that has reached as many individuals as this one did. “It’s been an extremely well-commented-on plan,” he said. It’s unfortunate that so much of the discussion has focused on just one site [Library Lane] and the issue of open space on that site. He said he’s comfortable that the park advisory commission is taking up the topic of open space. Tony Derezinski noted that the CWS report provides criteria for open space on these parcels. The report also makes a reference to Liberty Plaza, and he said it seemed like the criteria for open space is a response to problems at Liberty Plaza, located at Liberty & Division. He asked Amber Miller to talk about that. Miller described some issues that have been raised about Liberty Plaza – that it’s not very welcoming and there aren’t ways to “activate” the site, she said. Primarily, there are no building fronts that face the site. Instead, the plaza faces the sides of two adjacent buildings – Kempf House Museum to the south, and the building that houses Ann Arbor SPARK offices to the west. Ann Arbor planning commissioner Tony Derezinski. Miller also said the size of an urban plaza is important. Ideally, a plaza would be about the size of Sculpture Plaza (at Catherine & Fourth) or the Library Lane plaza that’s recommended by the CWS report. The smaller size forces people to be closer together, she said, which adds energy and interaction to the space. Derezinski pointed out that the CWS recommendations call for this kind of space to be maintained primarily by private entities. That’s right, Miller said. She noted that when there are privately sponsored events at Liberty Plaza – like the summer concert series Sonic Lunch, sponsored by the Bank of Ann Arbor – it’s very active. But the city doesn’t have the budget to program it every day, she said. That’s why the CWS recommendations call for private entities to step up, and at least partner with the city. Derezinski asked if the DDA looked at other cities for examples of successful urban plazas. Miller cited San Francisco as having several examples of publicly accessible space that’s privately owned. Noting that he’d been a part of the DDA’s leadership outreach committee for CWS, Kirk Westphal said he knew there was a high priority placed on using existing city plans as the basis for drafting the recommendations. For the concepts of shaping buildings and open space, what did the DDA use as resource documents? Miller replied that for massing and how a building interacts with the sidewalk, the DDA primarily referenced existing zoning and the downtown design guidelines, because those documents were most recently approved. Regarding open space and plazas, the CWS plan drew from existing zoning regulations as well as the parks and recreation open space (PROS) plan. Westphal said that in reading the PROS plan, it was hard to find a lot of information specifically about downtown open space – saying it seemed like a fairly low priority. Miller pointed out that this is why the park advisory commission is taking another look at that issue, via its downtown park subcommittee. The subcommittee will be looking at Liberty Plaza, as well as prioritizing existing park commitments and connections, she said. Westphal wondered if that process is in conflict with adopting the CWS plan. No, Miller said – it closely aligns with the CWS recommendations. Westphal ventured that the recommendations of that subcommittee, if incorporated into the PROS plan, would take precedence over CWS because the PROS plan is part of the city’s master plan. Ken Clein said it’s worth having more discussion about open space, and he looked forward to the park advisory commission’s report. He’s not a proponent of a central park like the one advocated by some people, because of the size. But he thinks there’s room for more open space downtown. Areas that are privately owned and maintained have worked well in other cities, he said. It’s challenging for local governments to do that, he added, because tax revenues can be unstable. Having open space amenities doesn’t just mean having a huge park, he said. Small inlet parks along the street can be wonderful places to escape, and the downtown needs a diversity of places like this. Eric Mahler expressed several concerns regarding open space, saying the city has looked at this issue “time and again.” He’d heard these issues repeatedly when the city issued a request for proposals for developing the top of the Library Lane parking garage several years ago. [Mahler was on the advisory committee that evaluated the RFPs, but the city council eventually rejected that committee's recommendation and no project was selected.] He said there haven’t been meaningful solutions from the public about the concerns he has. For example, if open space is privatized – as the CWS plan recommends – there will be challenges in keeping it active. There will also be issues of security, he said. Excerpt from a drawing in the Connecting William Street report, showing possible buildings on city-owned land. William Street is indicated in green. The dark purple spaces indicate the proposed location of open space. The building in the foreground is on the former Y lot. The taller building toward the top of this image is on the Library Lane site. Mahler also noted that he’s had private conversations with other planning commissioners, who have stressed that any open space must be meticulously planned. But that won’t happen under private ownership, he said. Mahler added that if the city starts offering premiums for open space in the CWS area – but not elsewhere in the city – then there will be a disincentive for developers to build profit-making buildings on the CWS sites. Developers will look elsewhere to build, he said. Wendy Woods referenced an image in the CWS report, which showed a building on the former Y lot with just a small section designated for open space. Given the input that the DDA has heard from many citizens, Woods said, why isn’t that open space larger? To have a drawing with only a small amount of open space “just irritates people,” she said. Susan Pollay responded, saying that the drawings are meant to suggest possibilities. In the case of the Y lot, the image shows an alternative to a solid rectangular building, she said. Pollay noted that students of UM professor Doug Kelbaugh had come up with other potential designs, including some with two buildings and lots of open space on that parcel. The drawings aren’t meant to be prescriptive, Pollay said, but rather are meant to show what’s possible when conforming with the city’s design guidelines. Bonnie Bona pointed out that the city has recently adopted a sustainability framework that includes fiscal responsibility. She noted there was a recent media report about the University of Michigan buying property and taking it off the tax rolls. Bona said she’s more concerned about the city buying property for parkland and taking it off the tax rolls that way. In addition, there are a huge number of properties in the floodway that can’t be developed, Bona said, which means the property taxes won’t be as great. The good news, she added, is that some of those properties are in the Allen Creek greenway, which fits with the city’s plan to create the greenway. As a member of the North Main Huron River task force, Bona said there’s a lot of parkland in that area, and more might be added there. But the city needs to look at parkland in a broader context, Bona said, not just one site. “We can’t have parkland everywhere.” Bona said she’s excited that the park advisory commission is looking at the issue of downtown parks – the PROS plan has recommended that such an analysis be done for many years. She hoped they’d look at it in the context of the whole city. Responding to Bona’s remarks, Woods noted that as a community, people in Ann Arbor talk about bringing more density downtown, while at the same time taking pride in green space and access to recreation. “Those two things are unfortunately going to be in conflict at times,” Woods said. The CWS plan calls for bringing more people downtown, so it’s incumbent on the city to provide more green space and open space for those people, Woods said. Some people think Ann Arbor has enough parks, she added, but those parks aren’t necessarily located in the downtown area. While the city might want to develop land that will build its tax base, Woods said, it’s important for people living in these downtown areas to have access to green space, too. Bonnie Bona referenced a recent project at 624 Church by the Pizza House owners to build a 14-story apartment building. In a previous renovation of Pizza House, she noted, they had “oversized” the foundations to allow this kind of taller building eventually to be constructed. She said she’s a strong supporter of buildings that can last for 100-plus years – so new structures must be flexible. She’d like buildings with an initial 400% FAR (floor-area ratio) to have the potential to build up to 700% FAR in the future. By way of background, FAR – a measure of density – is the ratio of the square footage of a building divided by the size of the lot. A one-story structure built lot-line-to-lot-line with no setbacks corresponds to a FAR of 100%. A similar structure built two-stories tall would result in a FAR of 200%. Ann Arbor planning commissioner Bonnie Bona. Bona also stressed that she’d like all the buildings designed to be flexible, so that they could possibly be converted to different uses in the future. She pointed to the difficulties that Sloan Plaza has had in converting some of its office space to residential use. Sloan Plaza is an office and condo building at 505 E. Huron. Sabra Briere pointed to the recommendation that there would be buildings on each of the five sites – and for some people, that sounds like it will happen immediately, she said. That’s not necessarily what some people want to do, she said, and the concept implies rapid change, in some people’s minds. Miller said the concept of building on each parcel came from the goal of wanting to increase downtown activity – more space for people to live, work and do activities. Asked by Briere what the timeline might be for this development, Miller said the timeline would be driven by the city council and by the sale of those sites. Briere noted that city councilmembers had voted at their March 4, 2013 meeting to direct the city administrator to prepare an RFP (request for proposals) for brokerage services to sell the former YMCA lot. No one was referencing the CWS plan during the council discussion, she said, as they spoke about how the site should be promoted to potential buyers. It concerns her that all of this work took place on the plan, but it’s not seen by councilmembers as a reference point. Briere noted that the main part of the plan that councilmembers pulled out is the recommendation that potential developers would need to go to the design review board twice. Briere’s final concern was that density isn’t a goal – it’s a means to an end. The end is to keep downtown vibrant. The council might decide to sell these sites rather than have the city try to plan the sites. That’s especially true for the former Y lot, she said. The council could easily decide just to sell it rather than work with prospective developers. And if it’s land on the open market, then it’s governed by the master plan. Ken Clein said it’s good that the city is planning for the future, to see where problems and opportunities exist. In his experience, communities that plan for the future are more successful. But the reality is that if properties are just going to be sold, then its D1 zoning that really will control development. Responding to a query from Clein, Miller said that drawings of what could be built on these parcels – based on D1 zoning – are available on the DDA’s website. The drawings included in the CWS recommendations reflect community input, she said, but that doesn’t override the zoning. Clein noted that if the city put out development proposals, they could put stipulations on what could go on these lots. But if the city simply sells the property, “then all bets are off.” He indicated that the “stir” about the 413 E. Huron project – a proposed 14-story apartment building at Huron and Division – is caused in part because people didn’t understand what could be built on that site under D1 zoning. Clein also had concerns about the D1 zoning of the lot next to Palio restaurant, at the northeast corner of Main & William. Allowing a building of 5-8 stories would be a harsh contrast to the existing height on that street, he said. Westphal wondered what the process would be to encourage development in the way that the CWS plan recommends. Miller replied that the land use economist hired by the DDA – Todd Poole of 4ward Planning – had looked at the recommendations and concluded that they were viable. But if the community wants something that’s not supportable by the market, then the city might need to be flexible in price, she said. The amount that a developer might pay for land to build a student high-rise apartment building wouldn’t likely be the same as for a mixed-use building with a cultural venue. Another factor is that the DDA has created a tax increment finance (TIF) grant policy to incentivize uses that the public values, Miller said – in situations where those uses aren’t supported by the market. 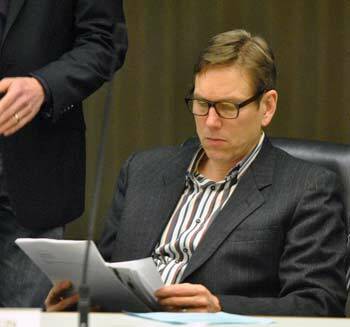 Ann Arbor planning commissioner Ken Clein is an architect with Quinn Evans Architects. Westphal noted that buildings with better architectural features or materials might better serve the community’s long-term interest, and provide greater value for the tax base, compared to lesser-quality construction that might serve a developer’s shorter-term financial interests. Miller agreed, saying the community values a longer-term return. Bona returned to the issue of density, noted that if the city council decides to sell the Y lot and it’s zoned D1, the building could be taller than what’s depicted in the CWS plan’s images, with more open space on the lot. She asked planning manager Wendy Rampson if that’s a correct interpretation. Rampson replied that the Y lot is in the midtown character area, which sets a maximum height of 180 feet. Bona said she wanted to warn the council about the potential for a taller building, compared to what’s suggested in the CWS plan. She also noted that if the Y lot is zoned D1, then the developer could potentially use a “super premium” – by providing affordable housing – to achieve 900% FAR, which would result in an even larger building. Ken Clein asked about the term “connecting,” and wondered what that implied. Amber Miller explained that the primary idea is to improve the connection between Main Street and State Street. If the city is trying to make those connections – creating pedestrian activity through some sort of development – Clein said he wasn’t sure if there was adequate space along William for streetscape developments that people will feel comfortable walking and lingering in. The sidewalks are quite narrow, and he wondered how that would impact recommendations for buildings to be constructed there. Clein recalled that several years ago for the city’s Huron, Fifth & Division study, there was a lot of discussion about the need to encourage buildings to be set back from the property line – especially along Huron, with a high traffic volume. The idea was to create enough sidewalk space so that pedestrians would feel comfortable there. Miller replied that a lot of the sidewalk expansion is recommended in the city’s non-motorized plan, and includes narrowing the street to accommodate broader sidewalks. Diane Giannola asked about the image that shows a possible mid-block cut-through. Is that conceived as being on public or private land? Would it be a long park or just a walkway? Miller replied that the image is simply meant to reflect the need for some kind of connection. The idea has been around for a long time, she noted, with the challenge of connecting Main Street to State Street. She said the CWS plan doesn’t address specifics of how this cut-through would be accomplished. 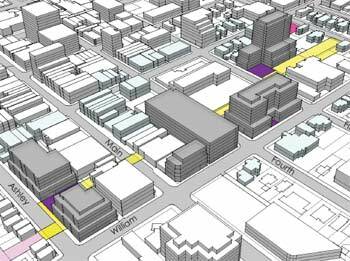 From the Connecting William Street plan: The yellow areas indicate possible locations for a mid-block cut-through from Ashley to Division. Susan Pollay, the DDA’s executive director, elaborated on this issue. Some pieces are already in place, she said. Library Lane, running between Fifth and Division, is publicly owned. Also, the AATA is hopes to acquire a strip of land on the Federal Building site, to the north of Blake Transit Center. If that happens, the AATA could create a walkway between Fourth and Fifth, she said. The other parts of the cut-through are “very conceptual,” Pollay said. For years, people have talked about using the gate by the Chinese restaurant and chocolate shop on Main Street to connect to the city-owned Kline lot on Ashley. But that Main Street frontage is private property. Bona also addressed the mid-block issue, saying that the concept was mentioned in the most recent PROS plan as a downtown priority. It’s also important to think about connections between existing parks, she said. Bonnie Bona noted that at one point, there had been discussion of a possible bike boulevard along William Street. It was intriguing to her, because that street doesn’t have the kind of automobile traffic that Liberty or Washington have. However, she didn’t see that concept in the final CWS plan. Amber Miller replied that the reason the report doesn’t include a bike boulevard is that more exploration is needed to see if it’s possible. Feedback from the city’s transportation staff is that William might not be wide enough and there are too many turning lanes to accommodate a bike boulevard. To provide greater flexibility in on-site uses and affordable housing resources, strongly consider providing the premium for developments that choose to make an in-lieu payment for affordable housing; This provides resources to the Affordable Housing Trust Fund and can be spent on additional units, services, and maintenance as needed. To ensure consistency, clearly define how the in-lieu payment will be calculated. He said he’s in favor of premiums that result in payments to the Affordable Housing Trust Fund, but it wasn’t clear to him what the goals were, other than generating money for that fund. Is the city really trying to incentivize people to build affordable housing downtown? That issue has been discussed a lot, and there are reasons why it doesn’t happen. Those goals need to be more explicit, he said. Connecting William Street: Commission Discussion – Resource Doc or Master Plan? Bonnie Bona addressed the issue of adding CWS as a resource document. One thing to keep in mind is that these sites are public property. For her, the master plan is helpful in dealing with zoning for private property. For city-owned land, the council can do anything it wants, she said – and it doesn’t have to follow zoning or the master plan. So she didn’t see the value in adding CWS to the master plan. Planning manager Wendy Rampson noted that the planning commission deals primarily with private property, but the master plan includes recommendations related to a broader range of issues, including public assets like parks, the transportation system and other elements. A resource document doesn’t have the same weight as a master plan, which would guide rezoning or land acquisition. In contrast, resource documents are used as references to “fill out the question marks” when issues arise, Rampson said – but those documents don’t dictate direction. Woods said that cleared things up for her. 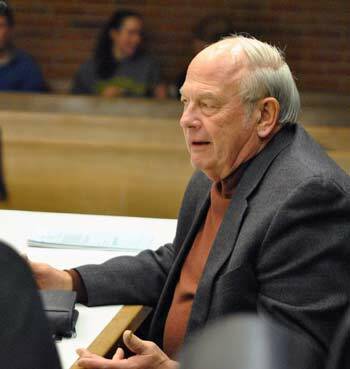 Kirk Westphal noted that he had been part of the commission’s ordinance revisions committee, which had been tasked with trimming the city’s downtown plan – part of the master plan. It’s a good choice to keep that downtown plan lean and approachable, he said, so the CWS plan would be better as a valuable resource document. Bona noted that while she would love to have her comments incorporated into the CWS plan, the commission typically accepts resource documents as they are written, and doesn’t attempt to revise them. She supported adding the CWS plan as a resource document that night, saying that there had been a robust process. Sabra Briere noted that the city council resolution directing the DDA to develop these recommendations had laid out a very detailed process, in four phases. She directed her question to Susan Pollay: If the planning commission accepts this report as a resource document, would that complete the third phase? If so, would the DDA then want to move to the fourth phase of implementation? Planning commissioners Diane Giannola and Kirk Westphal. Pollay replied that the DDA takes its direction from the council. The previous night, for example, the council voted to develop an RFP for hiring a broker to possibly sell the former Y lot. The DDA could help by offering grants that would help the council achieve its goals. So the DDA will follow the council’s lead, she said. Briere, who also represents Ward 1 on the city council, wondered when the DDA would be coming to the council to discuss potential implications of selling the Y lot. Pollay indicated that the DDA would do whatever is useful to the council. The DDA staff could meet with the broker to help that person understand what’s available to market the land. Developers will be asking if parking is available, for example, or whether there will be any infrastructure improvements happening in that area. The DDA could help the council in any way it wants, she said. “I see us as being on call – in the batter’s box, as it were,” Pollay said. The DDA’s partnerships committee – which includes representatives from the council and planning commission – is a good place for those discussions to occur, she said. Westphal asked Rampson what happens procedurally if the commission approved the CWS plan as a resource document. Would that action be transmitted to the council? Rampson indicated that unless the commission directed staff to transit it to city council, the document would simply be added to the planning commission’s list of resource documents, and posted online. Briere asked how the commission and staff actually use these resource documents. Rampson replied that the staff uses the documents in preparing staff reports for projects that are submitted to the city. They might also use it in discussions with developers prior to the submission of proposals – to give developers a sense of community sentiments. Connecting William Street: Commission Discussion – Postponement? Ken Clein suggested that in light of the confusion associated with the public hearing, he might propose postponement. Eric Mahler said it would only be worth postponing if the commission intended to modify the document. Wendy Rampson, the city’s planning manager, clarified that the commissioner had several options. They could approved the recommendation to accept the CWS plan as a resource document, or they could send suggestions for revision to the council. Or they could just leave it as is and not accept it. Tony Derezinski pointed out that this CWS report comports with the city council’s directive of providing recommendations. It’s very thorough, he said, and there had been a lot of public input. No one gets everything they want, but that’s part of the democratic process. He felt that if the commission were considering whether to add the report to the master plan, then the process might be different. But it’s proposed as a reference document, and he suggested the commission vote on that proposal, rather than postpone. Several others indicated a preference to vote that night, so toward the end of the discussion Clein said he didn’t have a problem voting, either. No motion to postpone was made. After the discussion concluded, a vote was called on the resolution accepting the CWS plan as a resource document. All commissioners except Briere voted in favor of the resolution. Briere hesitated. She explained that she was concerned that if the park advisory commission recommends one or more of the sites to be used as open space, then that’s a conflict with the CWS plan, which shows a building on each site. She said she’d vote in support of the resolution, but was hesitant about the outcome of this process. Outcome: The resolution to accept the CWS plan as a resource document passed unanimously on an 8-0 vote. Eleanore Adenekan was absent. In public commentary after the commission’s vote to accept the plan as a resource document, four people spoke to criticize commissioners and the DDA for how this process has been handled. Alan Haber told commissioners he hoped they would pull out for the city council one part of the CWS plan – the part that called for a park on the unbuildable section of the Library Lane site. That would make it possible to move forward on plans for that one space – saying there’s agreement on that. “The other stuff, no agreement at all.” He’s concerned that the CWS plan is taken as a representation of public input. The commission should also accept a citizens report done by the Library Green Conservancy and others, he said, about what should go on the Library Lane lot. That should be a reference document, too. Haber alluded to some commissioners who had described the public input as robust. “A lot of the robustity was citizens banging on the door and saying ‘Listen to us!’” The Library Lane spot is the center of a circle, he said. While there are other parks, a town center is needed. Haber said the conservancy is looking at other sites, too. There should be some green and public space on all of these five parcels, he said. He argued that the commission should look at other views of the sites, and not just take the CWS plan as the only reference document for that area. Stephan Trendov said he’s lived in Ann Arbor for 20 years, and he designs cities all over the world. Pointing to the unbuildable part of Library Lane, he noted that a lot of things have been carved out of it – elevator shafts, exits from the parking structure, a road. Only about 35% of the surface is left, he said. The people overwhelmingly want green space, he said, but the trees were taken out. He criticized Bonnie Bona for flip-flopping. “Some of you people vote politically – I don’t understand you!” he said. He called out Wendy Woods and Sabra Briere for voting in favor of accepting the CWS plan, even though they spoke against it. Trendov said he’d continue to fight for green spaces. After the public commentary, Wendy Woods said she wanted to bring back the item for reconsideration. She said her decision to ask for reconsideration of the item was prompted by concerns raised during this final public commentary. Under the planning commission’s bylaws, anyone on the prevailing side of a vote can make a motion to reconsider. Woods’ comment drew applause from the half dozen or so people affiliated with the Library Green Conservancy. Sabra Briere seconded the motion. It was troubling to her because many people had left the previous planning commission meeting believing that there would be no public hearing on March 5. [Typically, public hearings are announced at the meeting two weeks prior to when the hearings are held.] Many people rely on having more notice, and she’d be much happier postponing the item. Her remarks also drew applause, which she attempted to quell. Briere also cited concerns that the commission would be accepting this as a reference document for future planning, when the city council had been at best lukewarm to it. So she wasn’t sure she could go to the council and ask them to use it as a reference. Diane Giannola said she looked at it in a different way. It was a council-sanctioned project that the DDA performed. It was a compilation of public input, and the commission isn’t supposed to amend it – they’re supposed to accept it. It bothered her that some people have come to this meeting and are saying their input is more important than the input reflected in the CWS report. She opposed reconsidering the vote. Woods said the commission can never hurt itself by allowing anyone to have the opportunity to comment. She didn’t propose holding open the issue forever, because that would paralyze them. But there’s enough “cloudiness” around this issue that a two-week postponement, until the commission’s next meeting, would be valuable. She didn’t seen any harm in it. Maybe the commission’s final vote wouldn’t change, she said, but there’s enough of a question about the public process that it’s worth postponing. Eric Mahler argued that the council isn’t being asked to use the CWS plan as a reference document – it’s being added as a resource for the planning commission and staff. He opposed postponement. He was satisfied that sufficient public notice had been provided, and said they needed closure on this project. Briere responded, saying it’s true that the council won’t directly be using the document. But if the planning commission and staff use the CWS plan in making its recommendations to the council, then it does concern the council. That gives her pause. The DDA did what it was asked to do, she said, but the commission and council have the option of not using it. Bonnie Bona said the main concern is whether the CWS plan includes enough open space. She noted that the plan gives the responsibility for making those kinds of recommendations back to the park advisory commission, “and that’s where it belongs.” The CWS report doesn’t contain anything that overrides the city’s master plan, which includes the parks and recreation open space (PROS) plan. There’s no reason to reopen the discussion, she said, because nothing will change in two weeks. “We know what the concern and controversy is – it’s open space.” And that’s addressed by asking the park advisory commission for its input, Bona concluded. Ken Clein agreed with Bona. While he’d like to see more open space referenced in the CWS plan, his preference is probably for less than what others would like. But the commission can’t let the perfect be the enemy of the good, Clein said, and this is a good reference document. Even if the report were perfect, he added, at the end of the day it’s the city council’s call. They could sell off all the properties without any regard to the CWS plan, if that’s what they wanted to do. He did not support reopening the item for reconsideration. Kirk Westphal said normally if there’s any doubt about public input, he’d be inclined to support postponement. But given the scope and number of people involved in developing the CWS plan, he was comfortable accepting it. Woods said she’d respect whatever her colleagues decided, but she was not convinced she’d heard everything there is to be heard about this issue. This is a massive document, she said, and there could be someone else out there who didn’t know about the public hearing and who might want to say something. “It’s two weeks,” she said. “It’s not a lifetime.” The outcome might be the same, but she’d heard enough to give her pause, and didn’t see the need to hurry. That’s why she wanted to postpone. Outcome: The motion to reopen this agenda item for reconsideration failed 2-6, with support only from Woods and Briere. Eleanore Adenekan was absent. Present: Bonnie Bona, Sabra Briere, Ken Clein, Tony Derezinski, Diane Giannola, Eric Mahler, Kirk Westphal, Wendy Woods. The vote by the Planning Commission to designate various documents, including the Connecting William Street recommendations, as “Resource Information In Support Of The City Master Plan” was improper and has no legal validity. As mentioned in the article, the Planning Commission’s rules require an agenda with all relevant documents to be posted by Friday of the week preceding the meeting. The Commission’s agenda was posted without the resolution and therefore could not be acted upon at this meeting. Looking at the meeting agenda in the days prior to the meeting, I understood the Commission intent to be that it would consider adopting the CWS recommendations as part of the Master Plan. That effort, of course, would not have majority support on Council and therefore could lead a citizen to believe that attendance at the Commission meeting was unnecessary. Instead of pursuing that pointless goal, the Commission announced for the first time at its meeting that it would adopt the CWS recommendations as an official resource document for planners to rely upon in the future. The agenda did not reveal this intended course of action and thus, citizens were denied the opportunity to attend and speak on the use of this report as a basis for future planning efforts. The Planning Commission needs to revoke its prior improper actions regarding the CWS recommendations and properly provide advance notice of a public hearing on the adoption of the CWS plan as an official planning document. As I recall the A2D2 deliberations by Council, neighbors spoke slowly in short sentences comprised of easily understood vocabulary to explain the terrible consequences of approving D-1 zoning for the 413 E. Huron property. For those incapable of understanding plain English, one neighbor provided a scale drawing of what could be built on D-1 property compared to the two-story homes to the immediate north. No one should argue that Council, or the public for that matter, misunderstood what could be built on the 413 E. Huron property when Council approved the A2D2 zoning changes. It is incomprehensible for Mr. Clein to assert that the 413 E. Huron disaster was caused by some kind of misunderstanding. Even though the council that was in place in November 2009 may have had little qualms in going against the master plan, the expert studies, and the will of the people in order to promote their density agenda; and, even though that council approved D1 on the north side of Huron with eyes wide open, FOUR of the members of that council are no longer at the table, and a fifth voted against the A2D2 zoning in the first place. Now we have a council that is more attuned to what the citizens and experts expressed in all the studies and recommendations and plans made between 2000 and 2009. They are fully empowered to right the ship and they should do so. Because of the confused, short notice for the public hearing and the limitations placed on individual speakers, those of us who attempted to explain what is wrong with the DDA’s report were at an extreme disadvantage during the March 5 Planning Commission meeting. The Library Green folks are hopeful that the Parks Advisory Commission will be able to look at the need and potential for downtown open space more objectively than the DDA. Putting opinions about the CWS plan aside, this action had serious procedural flaws. The discussion also highlights a disturbing trend among some planning commissioners. More and more, some seem to be making planning decisions based on their personal views, rather than on any public-oriented planning process. We heard Eric Mahler bring up “security” when he was on the RFP advisory committee for the Library Lot. This is a code word he uses for the homeless. Bonnie Bona repeatedly pushes for more intense development, regardless of the situation. There are other examples. In addition, Kirk Westphal’s action on this was doubtless colored by the fact that he was on the committee devising the plan. My view of the role of planning commissioners is that they should serve as adjudicators of planning decisions, based on plans that have been approved by the City Council after the full array of community-based review. They should not be advocates who make arbitrary decisions based on their own personal visions. In this case, Council had never been given an opportunity to respond formally to a report which they themselves commissioned. Evidently the response of Council at a working session was cool to the report. This action appears to have been an end-run around Council. This action of adding the CWS report to planning documents at the last minute, without a properly noticed public hearing, without any past indication that such an action was contemplated, and in addition to the biases shown by individual commissioners, casts a dubious light on the very integrity of the Planning Commission and the city’s planning organization. My heartfelt thanks to Commissioner Wendy Woods for her courage in going against the current on this and other recent issues. She certainly has the long experience in city government to lend credibility to her conclusions. I have commented to City Council about the uncomfortable heat rising from the concrete cement around the Library. When we had a community picnic last summer, the combination of large areas of concrete floor plus the sun radiating the heat which was intolerable even on a moderately warm day was very uncomfortable to me and others, I’m sure. I was told there was not enough room for trees that might cut some of the heating effect. I suggest maybe smaller trees around the periphery that would not have terribly large root system and/or grass and shrubs in stead of solid concrete. There’s nothing pleasant about roasting in the sun.